Nvidia reckons it has finally cracked the problem of smoothly swapping between graphics chips in notebooks that have more than one GPU. Today, it launched its solution, which it has branded Optimus. Now, we're not talking two or more GPUs configured in SLI mode for greater graphics performance. Optimus addresses the use of a discrete graphics chip that operates when you're running software that needs one, and a separate, integrate graphics core that handles all the other tasks, and does so with a much lower impact on battery life. This isn't a new notion. To date, there have been plenty of laptops with two GPUs. Originally, they required a physical reboot two switch between them, to allow Windows to load the appropriate driver. That also meant saving work and shutting down applications then reloading them after the restart. Later, vendors worked out how to flip between the two at the flip of a physical switch. That too required a driver switch, causing the screen to flash and momentarily display garbled pixels while one GPU quit and the other kicked in, but without the need for a full restart. If the brief blast of screen junk wasn't bad enough, the switching process had to be triggered by the user. You had to decide whether the app you planned to launch would benefit from a full GPU or not, and make the switch accordingly. And then back again when you were done, to ensure your battery wasn't being depleted as quickly. Few folk, we suspect, bothered to do so, and Nvidia claims its own research shows that just one per cent of dual-GPU laptop owners ever switch between graphics chips. Nvidia's key promise is that Optimus will do all automatically and behind scenes so that the user doesn't even need to know it's happened. "It should work like a hybrid car," says Rene Haas, head of Nvidia's notebook GPU operation. 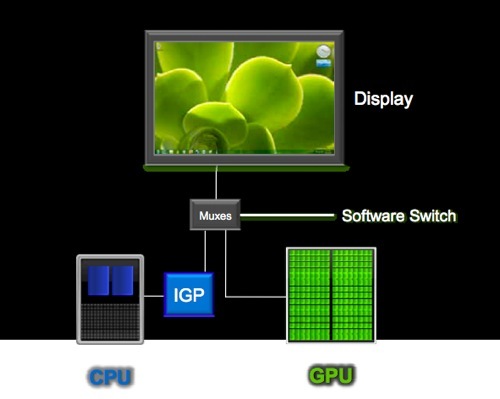 Flipping between GPUs should happen as smoothly and as transparently as a hybrid switches between electric and petrol propulsion systems.